Acknowledgement: The workshop has been funded by the Austrian Federal Ministry for Education, Science and Culture (BMBWK), and the Austrian Development Cooperation (OEZA) (funding for Austrian Alumni as workshop presenters). We thank the Austrian Exchange Service (OeAD) for facilitating the participation of Austrian Alumni from Kenya, Uganda and Nepal, and the Austrian Academy of Sciences for hosting the event. Members of the organising committee were Birgit Habermann (KEF), Ruth Haselmair (KEF), Michael Hauser (DEVFORUM), Karla Krieger (BMLFUW), Margarita Langthaler (ÖFSE), and Nikos Tzaferis (VIDC); the committee was kindly endorsed by BMBWK, the Austrian Exchange Service (OeAD) and the Austrian Development Cooperation (OEZA). 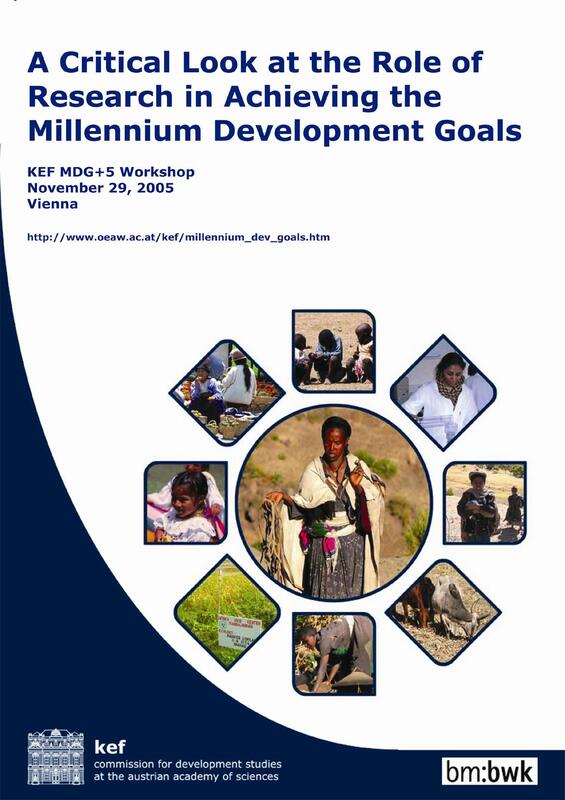 Mission Statement: The Commission for Development Studies at the Austrian Academy of Sciences (KEF) aims at bridging the gap between science and development in supporting a development-oriented approach in research and science. To facilitate this process, KEF both carries out applied cooperative research projects with Austrian partners and partners in developing countries and acts as an advisory body to the scientific community, government bodies and funding agencies with regards to scientific issues of development cooperation. KEF represents a clearinghouse for research for development and serves organisations related to research, private sector and development cooperation on a national and international level as a contact point. KEF regards proactive information lobbying and networking among institutions as an important task for its work. KEF represents a multi- and interdisciplinary platform for all stakeholders involved in scientific issues of development cooperation as part of a European and global scientific community.